Miss Hope introduced our 2.5-year-old daughter to dance and she has, by far, been the best teacher our daughter has known. Hope possesses an enthusiasm for dance that is infectious not only for her students, but also for their parents. Her passion for teaching dance is obvious and shines brightest in the classroom where the love shared between her and her students is palpable. Through positive reinforcement and leading by example, she controls her classroom masterfully which results in an experience rich in skill development with lots and lots of fun! Ms. MacDonald clearly has a way with young children. She is patient, energetic and obviously enjoys her profession. Ms. MacDonald took the time to focus on each child individually and provided them encouragement and direction in a manner that was highly conducive to learning and finding great pleasure in the activity. She is adept at translating ballet concepts and techniques into terms children can understand and appreciate. She uses a variety of educational techniques to demonstrate dance concepts, while addressing the multiple learning styles of the children (i.e. reading books, dressing-up, playing “pretend”). Hope MacDonald of Bella Ballet creates a wonderful fairytale land that every princess must experience. Thank you for making my daughters first exposure to ballet such a memorable experience! She can’t wait for her next class. Dancing with Miss Hope is like taking lessons from a real live Disney Princess! From the moment you enter her studio, Miss Hope is larger than life and her energy transfers to the little girls as excitement and love for dancing. Dance instruction is infused with make-believe play in which every girl is a “ballerina princess.” I catch myself peeking into the studio windows to witness the magical fun my daughter is experiencing. This is a fun part about having a little girl! If you are looking for an amazing and confidence building dance studio for your little one, you have come to the right place! Hope is so great with the kids and so professional. She has an awesome ability to be gentle yet firm during class. The kids really respond to her and adore her. We are blessed to know Hope outside of the studio and I can honestly say she is a young woman who has an exciting future ahead of her! She is kind and giving and truly loves to teach. Miss Hope is an amazing ballet teacher! My daughter just loves her and looks forward to her class each week. She has learned so much in short period of time and I even catch her practicing on her own. You can truly see how much Miss Hope cares for each of her students and adjusts her teaching style to fit each student’s needs. My daughter has just bloomed since she started Miss Hope’s ballet class. Give Us A Call. We Are Here To Help. Doesn’t every girl deserve to be a princess? At Bella Ballet, we think so! Bella Ballet is a traditional dance studio with a hint of magic. Bella Ballet’s mission is to provide a quality dance education inspiring children with confidence and self-esteem. We teach various styles of dance ranging from traditional ballet to Poms, Tap/Hip Hop, Broadway/Musical Theater to Adaptive dance. We have been awarded for our excellence over many years. 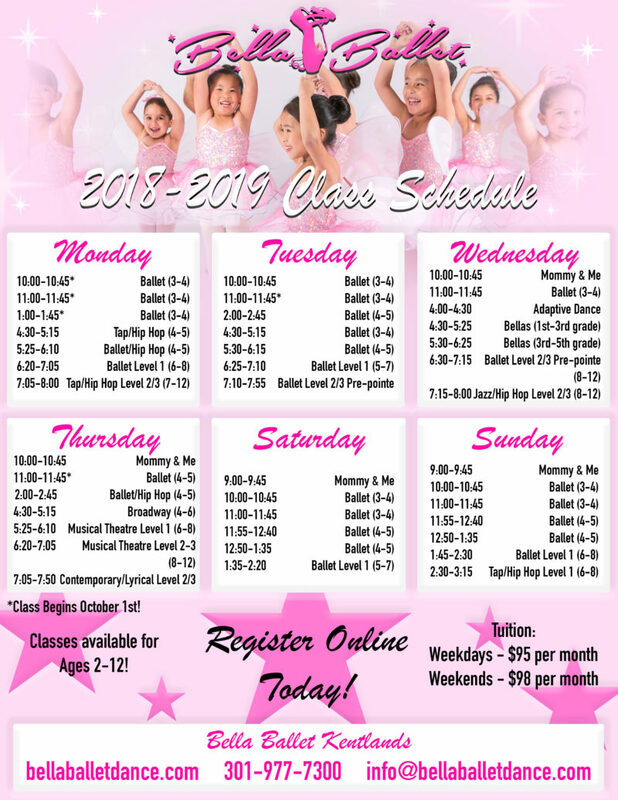 Bella ballet is located in the heart of Gaithersburg MD located in the Kentlands Shopping Center. © Copyright | Bella Ballet Dance | All Rights Reserved | Design and Marketing by Blittzed!